An educator and political scientist by training (and no, he never did get to dissect a politician in poly sci lab), Steve spent a year teaching in inner city Washington, D.C. and then co-founded an alternative high school, the New Educational Project. He and co-founder Joel Denker wrote a book about their experiences, No Particular Place to Go: Making of a Free High School (Simon & Schuster, 1972). He then went on to teach labor history and ethnic studies at Wayne State University, and creative writing at University of Michigan. 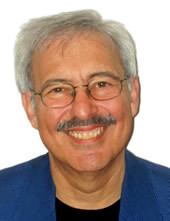 In 1980, he founded one of the first holistic monthly magazines, Pathways, in Ann Arbor. Pathways saw the “birth” of the cosmic comic character, Swami Beyondananda, and Steve and his wife Trudy embarked on a full-time venture with his traveling Swami show in late 1986.